For instructions on how to install, please see the INSTALL.md file. After installing, for instructions on how to get started please see the wiki . Both the client and server can be extended with functionality provided by plugins. A small number of plugins are packaged with King Phisher and additional ones are available in the Plugins repository . 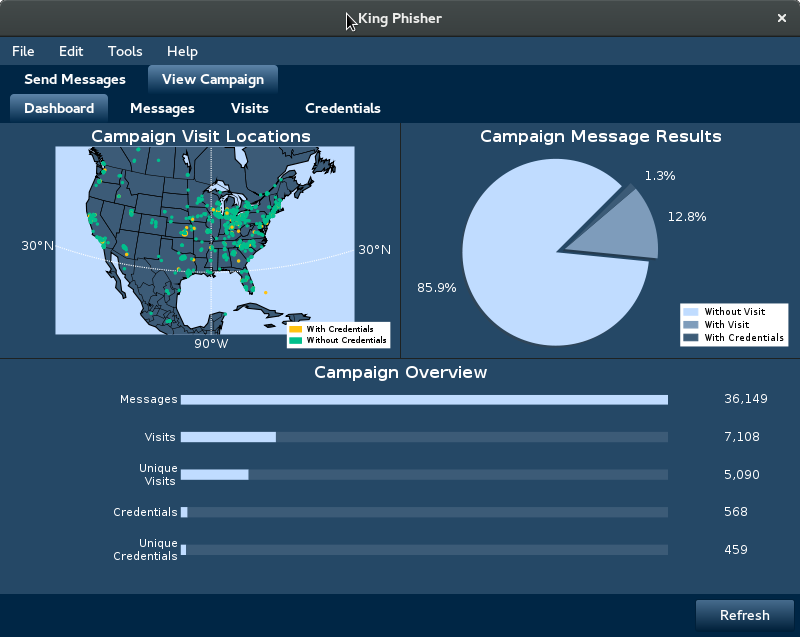 Template files for both messages and server pages can be found in the separate King Phisher Templates repository . Any contributions regarding templates should also be submitted via a pull request to the templates repository. The client message templates are formatted using the Jinja2 templating engine and support a number of variables. These are included here as a reference, check the templates wiki page for comprehensive documentation. The uid is the most important, and must be present in links that the messages contain. Documentation for users of the application is provided on the project’s wiki page . This includes steps to help new users get started with their first campaigns. Additional technical documentation intended for developers is kept seperate as outlined in section below. King Phisher uses Sphinx for internal technical documentation. This documentation can be generated from source with the command sphinx-build -b html docs/source docs/html . The latest documentation is kindly hosted on ReadTheDocs at king-phisher.readthedocs.io . King Phisher is released under the BSD 3-clause license, for more details see the LICENSE file.